It’s not every day you hear a story starting with “when I died,” but that’s how 22-year-old Amber Moloney remembers Feb. 6. Moloney, a Beaufort native and a senior studying exercise science at Winthrop University, was one of three fitness interns at Hilton Head Health this semester. 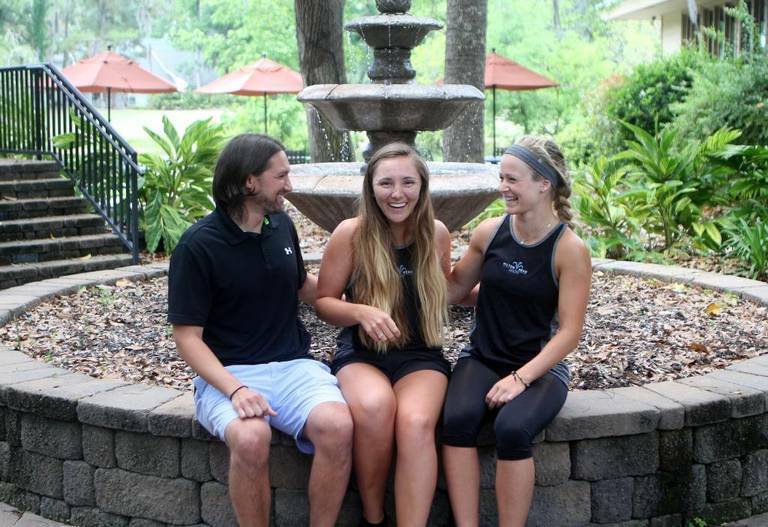 The three — Moloney, Audra Weis and Shane Wilson — started interning at the wellness retreat and weight loss spa resort on Hilton Head Island near the beginning of the year and have been pretty much inseparable. “We did everything together, so we’re a pretty tight group,” said Wilson, a senior at Colorado State University. And just like every other day, on Feb. 6, the interns went through their daily routine — health screenings at 7 a.m., leading four or five fitness classes during the day, and joining each other in the fitness room about 5:30 p.m. for a workout before dinner. But on this day, something went wrong. In the middle of their workout, Weis, a senior from the University of Wisconsin-Stevens Point, noticed Moloney in the opposite corner “moving weird,” she said. Moloney collapsed “face down in a pile of dumbbells,” Wilson recalled. He immediately turned Moloney over, exposing her “bright blue face” and moving her away from the equipment. As Wilson quickly began performing CPR, Weis dialed 911. Moloney began coughing and spitting up foam but remained unresponsive, so Wilson continued his compressions. The dispatcher helped Wilson perform CPR by playing a metronome beat, giving Wilson a rhythm to stick to with his compressions. In the meantime, Weis flagged down Andrew Evans, 31, in the parking lot, and he ran back in to help. Evans, a program concierge at Hilton Head Health, took over CPR as Wilson ran outside to guide the EMTs into the room. The EMTs arrived in less than six minutes, according to Weis’ phone records. When they arrived, Moloney had a heartbeat. But, moments later, Moloney’s heart stopped again, so they used a defibrillator and shocked her about four times, according to Wilson. The next thing Moloney remembers is waking up on the fitness room floor with about four EMTs towering over her. The ambulance then rushed Moloney to Hilton Head Hospital. She spent a night in the hospital and was transferred to Roper St. Francis Rehabilitation Hospital in Charleston. She was there a week while doctors ruled out any serious heart problems. Moloney had surgery to have a defibrillator — which she calls her “cool new toy” — implanted to prevent similar cardiac arrests in the future. “When something like this happens to someone, you want to be careful (what you say), but (Moloney) jokes about it with her same positive attitude,” Weis said. Aside from a three-inch scar near her heart, you would not guess by looking at her that Moloney went into sudden cardiac arrest less than three months ago. The teamwork between Moloney’s co-workers, the dispatcher and emergency response groups were all factors in keeping Moloney alive. Moloney is almost fully recovered now and back to interning at Hilton Head Health. She continues to run 5 miles every other day and completes the same workouts she did before. And this weekend, Moloney is attending the inaugural South Carolina Resuscitation Conference on Hilton Head Island, where her story as a cardiac arrest survivor will be shared.